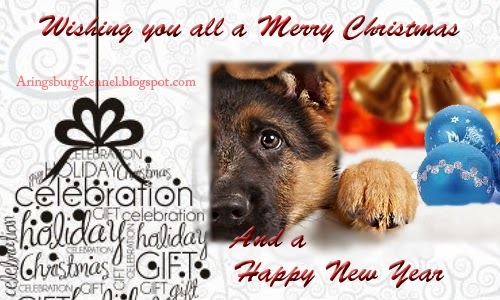 To all of my friends I have made through this blog, those who left for a while and those who have stayed... Merry Christmas and a very Happy and Prosperous New Year 2014 with heartfelt love. Your German Shepherd puppy should get a balanced diet. Any highly reputed commercial dog food brand that "meets the nutritional requirements of puppies established by the American Association of Feed Control Officials (AAFCO)" is recommended. Your vet should be the best person to give you a proper guidance about the brand of dog food for your puppy. 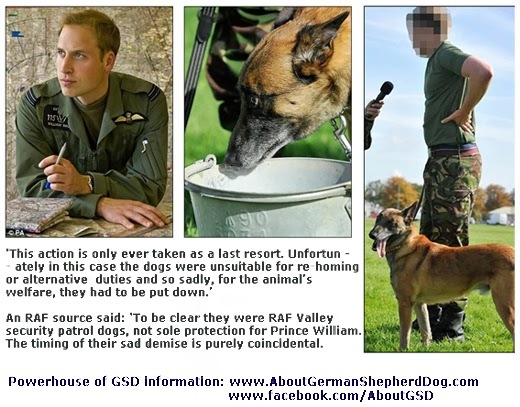 Remember that all dog food brands that are hugely advertised may not be good for dogs. There's nothing like home made foods if they are prepared keeping in mind your puppy's nutritional requirements. Chicken neck: Properly cooked chicken neck is highly beneficial for your puppy because chicken neck is rich in natural calcium. There is no risk developing splinter with chicken neck. Moreover, necks are easy to digest for your dogs. Pure Chicken: Apart from just neck, pure chicken meal is very rich in vitamin B6. Vitamin B6 is essential for the metabolism of carbohydrate, fat and protein and production of RBC and strengthens the immune system. Chicken gizzards and hearts: Both chicken gizzards and hearts are rich source of natural zinc which helps in strengthening the ligaments. Apart from zinc these are are rich sources of iron, which is one of the most essential components for puppies during its growing phase. Both heart and gizzard provide all B vitamins - especially vitamin B12. Heart and gizzard are also very decent source of riboflavin, folate and pantothenic. Chicken hearts are good for your dog's heart too. Chicken liver: Chicken live is a nutrient-rich organ that is rich in vitamin A, vitamin B, protein and essential minerals like phosphorus, zinc, iron, niacin and copper. Liver is a decent source of omega-3 and omega-6 fatty acids, and amino acids that are essential for your growing GSD puppy. Feeding too much of liver may lead to constipation. Give your pup small quantity of it daily or moderate quantity for at least 4 days a week, giving gaps in between. Give him green: I have purposefully and consciously used this phrase "give him green" in many of my articles across the web. Remember that puppies that are kept only on meat and egg do not get balanced diet. Vegetables like asparagus, broccoli florets, brussels sprouts, carrots, cauliflower, edamame, green beans, peas, sweet potatoes, potatoes, pumpkins, green papaya, gourd, spinach. Pumpkin and pumpkin seeds - Pumpkin effectively prevents constipation. Pumpkin seeds are rich in essential fatty acids and antioxidants that are good for a growing puppy. According to many vets pumpkin is good for overall healthy skin and fur and also promotes urinary health. Gourd: Gourds are rich source of water and helps keep your puppy cool from within. It prevents dehydration. Eggs: Eggs are rich source of protein and even water. Many dog owners have misconception that raw eggs are good for your puppy. the fact is that raw eggs block the absorption of biotin and hence is not recommended. Always feed your pup cooked eggs that are good source of digestible protein. Boiled eggs are rich in riboflavin and selenium, which are beneficial for your growing pup. 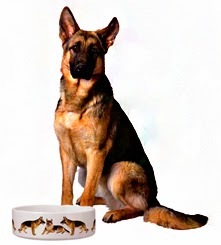 Your growing German Shepherd puppy need more than just balanced food. Water: Last but not the least Water is one of the most essential nutrient for all animals. Healthy puppies regulate their consumption of water as long as they are provided with fresh and clean drinking water. Water is the only thing that helps flush off the toxins from your puppy's body. Water aids your pup in proper digestion of food and helps its body to absorb all nutrients. Puppies that are kept mainly on dry food, may need more water than they may consume naturally. Consider giving them soup prepared with all greens and meat products. Correct measurement: Quantity is as vital as quality. Overfeeding your GSD pup will eventually lead to a series of health disorders including skeletal as well as digestive problems, thereby checking the growth process. It is important to break the meals in small quantity to be given 5 to 6 times a day keeping enough gap in between for proper digestion. Play: Free play is associated with proper digestion, and mental and physical stimulation, which are hugely important for your puppy's growth. Free play also increases the water intake that has already been marked as important for your puppy. However, don't let your puppy to drink water immediately after the play. Last of all remember that your German Shepherd puppy may be allergic to one or more components here that have been discussed. If your pup is allergic to any of the compenent(s) consider giving it to your pup. Do you have more than one German Shepherds? Great, if you have! 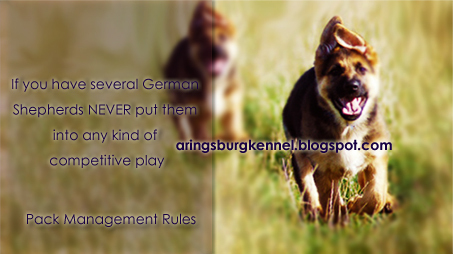 And I hope you know all rules of keeping multiple dogs - especially large breeds GSD, Rotties, Danes and Dobs. If you already know and if you are an experienced dog owner having several dogs, I am sure you will still like to read this post. This post is going to talk about something that probably many of the professional trainers and canine behaviorists do not tell you while giving you advices. Here is why you should NOT kennel all you dogs together even though they are highly obedience trained. Yes... it is suggested not keeping all your dogs (irrespective of breeds, types, groups and size) together as a group in a single unit. Once your German Shepherd puppies reach an age of approximately 70 days you should consider kenneling them in separate suites. As several German Shepherd puppies grow together under one roof they will eventually develop a very strong pack. Since pack instinct is already genetically ingrained in dogs the instincts gets strengthened as they live and grow together in a single suite. Once your group of shepherds starts developing the pack they will also have a pack leader - the "Alfa Member" of the pack, who is usually the dominating specimen of the group. Eventually he/she (pack leader) will develop dominance problem. Moreover the pack, as a whole, will gradually turn out to be more and more territorial. The entire pack will consider the whole area where all of them together or any member of the pack roam about as their territory. This means their territory widens up. Not only this, the pack's prey instinct will also be strengthened, which in turn stimulate the whole pack to exhibit attacking tendencies within their territory that is already wide. Pack problems, at times, turns a simple undesirable behavior to a serious intra-pack aggression which can end up with an irreparable loss. Most types of group bad manners is often a start to aggression, which cannot be handled easily - especially when its a pack of large breed dogs German Shepherd, rottweilers, Dobermans etc. Exception: There is obviously ONE exception to this norm. Opposite genders can be kept together in a single suite. And this is the only one single exception! Particularly for Bullmastiffs two males or two females should NEVER be left together unsupervised. Kenneling: Kennel you dogs separately in different units. Keeping them separately will not allow them to develop a pack. This means your dogs will have little chance to develop pack bad manners. 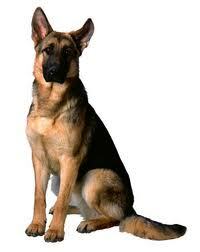 Feeding: Feed the German Shepherds separately - preferably in different rooms each closed. NEVER let your dogs eat from a single bowl at the same time. Playing: Walking them together, if they are obedience trained, is good; but it's a bad idea to put them into competitive play like letting them all fetch a ball or a Frisbee at the same time. Wait Exercise: The wait exercise is a good practice - especially when you have taken all your dogs to play freely. It is, however, essentially necessary that the pack should learn to wait until they are asked to go do something. This will keep them from getting into any competition during the play. Share: Make sure that each member of the pack gets their fair share of attention, love, enjoyment, play and food. The chance of fight for these things will be mitigated. Treating all dogs equally in front of each of them: It is important to support the dominant one when all other pack members are together. However, it is also important to treat all of them equally but love them with equal weight in their separate room. After all each of them deserves equal love and care. Why Isn't Your German Shepherd Coming When He Is Called? The answer is very simple! You are right if you guess that the dog is not properly trained to come when called. If your German Shepherd is unresponsive to your command, then the fact remains that you have not able to teach him learn the trick. However, while breaking up the reason there could be found a series of factors playing underneath your pup's ignoring tendency. The training is insufficient for your dog to act off leash. Training on the leash should be continued effectively until your pup is properly groomed up to act on command off the leash. The basics are still weak. It is important to understand that your German Shepherd are wary of strangers and won't effectively learn your tricks amidst the mob. 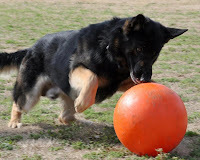 Your German Shepherd is quite intelligent (more intelligent than many of the other dog breeds), but correct training procedure demands not to overwhelm him with fussy noise; nor to forcing him giving you attention. The trick of effective training lies in making the training session easy and enjoyable for your dog. Booty drive is German Shepherd's one of the basic instincts. When your GSD pup is exposed to the nature and if he finds any moving object like a butterfly or a squirrel he would instantly chase it. If he is not coming back on your command you are loosing the competition with his instinct that is reinforcing him to ignore you. This is happening because his instinct is stronger than your way of training him, which in turn means that your training is not effective enough to win over his attention. It is important that you know this breed first and then you know the specific subject that you are dealing with - your dog. Establishing the 'Alpha' membership is a must. 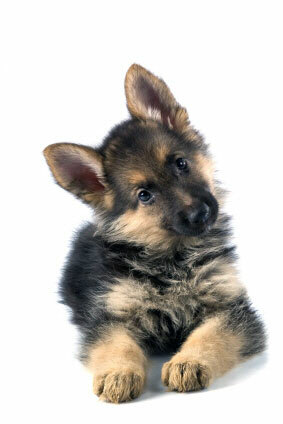 If your German Shepherd pup's apprehensive of coming to you when you call him, the reason is "You". You have failed to establish yourself as an alpha member of your pack. Remember that establishing yourself as the leader of the pack doesn't mean yelling at him or punishing him to prove your strength. It is important to be sweet and cool with him, yet you must have a strong and powerful character to prove your dominance. Very weak or no reinforcement from your end encourages your pup to ignore you next time. This is another very important factor that contributes to your pups tendencies of ignoring you when you call him. When you call you dog and he comes to you it is most important to reward him with lavish praise and prove that you are happy for he listened to you. 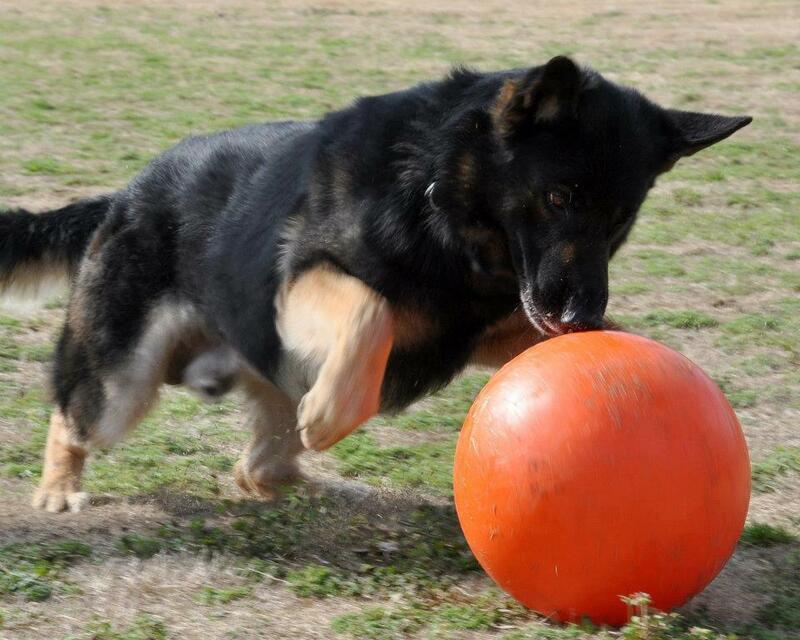 Remember that German Shepherds are intelligent dogs and will be ready to make you happy by doing what you want. 'Praise', here acts a very strong reinforcement factor that encourages your dog to come to you when he is called. Your GSD pup is smart enough to understand what you may want him to do! Your dog understands that you may want him to get inside, while he still wants play. This means he is not yet fully exhausted. Remember a tired dog is a content dog; and well bred German Shepherds have high level of energy. Full-fledged exercise is required to make him content. 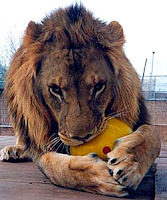 A long time free play will help him exhaust his energy and he would be happy to go inside readily. However, this is situational. It is not always that you may want him to go inside. It is, hence, important to analyze the situation and try to understand what might be going in his mind. Praising him always when he makes you happy is the best trick ever! Do You Need to Clip Your German shepherd Dog During Summer? Summer is a season that puts wrinkles in the forehead of German Shepherd Dog owners. Many GSD owners – especially the new comers tend to clip/ trim their dogs’ coat, thinking that trimming would make their dogs’ life comparatively comfortable in an extreme environment where the outside temperature is much higher the body temperature. Fact is that you should NOT trim your dog’s coat in the hot weather season. The body temperature is radiated out via panting, not through the skin, unlike humans. For human the sweat is evaporated on the skin surface, and the process acts as a cooling mechanism. But for your dog, evaporation doesn’t happen on surface of its skin, and air circulation, hence, is not much important on the skin surface. Trimming or clipping hair is not necessary. Remember a trimmed German Shepherd faces tougher times during summer than its untrimmed counterpart. Coat acts as an effective insulator against environmental heat. If the environmental temperature is warmer than the body, then the body gets heated up faster if the insulation is removed. 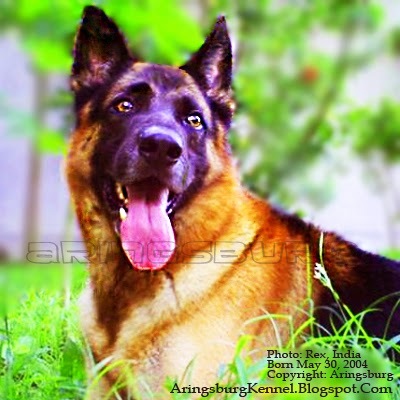 German Shepherds, like any other canine breed, have thinner layer of coat in their inguinal region. Whenever they have to cool down they would lay on cooler surfaces with the region exposed to the surface. This way they would help themselves to radiate off their body temperature. So, it is recommended not clipping your shepherd’s coat during the summer. Keep him in a cooler place inside that is airy. Natural thermoregulation through panting allows a dog to drop his body temperature. However, brachycephalic dog breeds (breeds with broad, short head like Boxers, Pugs, Bull Dog, Boston Terriers, Shar Pei, Cavalier King Charles Spaniel etc.) do not pant effectively. This, consequently, leads to insufficient thermoregulation, which over heating during the hot summer days. Mesaticephalic or Mesocephalic dog breeds (breed that have intermediate length and width of head such as German Shepherd Dogs, Dalmatian, Cocker Spaniel, English Foxhound, English Springer Spaniel, Field Spaniel, Labrador, Komodor etc.) can thermoregulate through panting better than the brachycephalic dog breeds. Hence they have comparatively lesser chance to get overheated during summer. On the other hand the dolichocephalic dog breeds (breeds that have long slender head like Afghan Hound, Great Dane, African Azawakh, Borzoi, Chart Polski, Galgo Español, Greyhound, Hortaya Borzaya, Irish Wolfhound, Italian Greyhound) are least prone of get overheated during the summer, because they pant most effectively. However, whatever type of breed you own, it is important to keep your dog in cool place, with making fresh water readily available. And it is one worst idea to trim GSD’s hair in the summer.